Dejima was a small artificial island just off the coast of Japan, near Nagasaki. During the 18th and 19th centuries, it was the Eastern outpost of the Dutch East India Company, the only Europeans that the Japanese would trade with. It is also the setting of David Mitchell’s new novel, The Thousand Autumns of Jacob de Zoet. David Mitchell has been on my long list of authors to try for years, probably since the publication of Cloud Atlas. This novel, which I won through LibraryThing’s Early Review program, is the first of his books that I’ve read, and what a book it is! The setting, a tiny bit of Europe adjacent to one of the most insular of all Eastern nations, cannot help but provide wonderful material as the characters must find ways to communicate with and understand one another while retaining their commitment to their own nations and beliefs. At the center of the story is Jacob de Zoet, a young clerk who has come to Dejima to make his fortune so he can get married. I loved Jacob almost from the start. He’s extremely clever and highly principled, but human enough to worry about the effects of his actions. Jacob faces plenty of moral dilemmas as he works to reorganize the Dutch East India Company’s records after years of corrupt management, but Jacob is too good a man to take the easy way out and give in to the dishonest practices of many of his compatriots. He’s not perfect, however; he struggles with his attraction for the midwife Orito Aibagawa and ends up making a decision that has dire consequences for Orito. I was impressed with the way Mitchell handles the cultural conflicts inherent in the historical setting. This is no pure East vs. West story, with one culture held up as the one that is truly enlightened and the other as barbaric. Both the Dutch and the Japanese cultures are depicted as having something to offer, as well as an unfortunate shadow side. Some individuals, of course, are further in the shadows than others, but Mitchell does a nice job of giving both cultures (as well as the English who appear later) their fair share of heroes and villains and some people who fall in between. 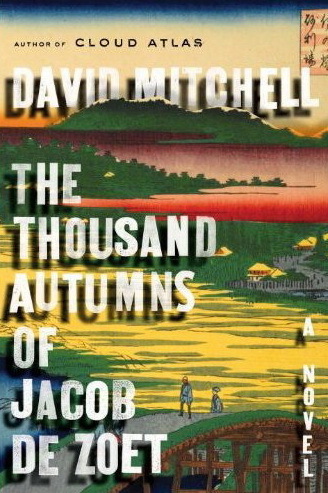 Besides having a fascinating historical setting, The Thousand Autumns also offers an exciting story. There are dodgy business dealings, shocking occult practices, a daring escape and equally daring rescue, a sea battle, political wheeling and dealing, and more. A few sequences left me breathless with shock, particularly in the second part of the book, which focuses on Orito’s life at a bizarre shrine in the mountains. And then there are some wonderful digressions, such as when the men who serve with Jacob explain how they ended up with the Dutch East India Company. Some of those characters’ histories could easily have been expanded into full novella-length stories of their own, but then the book would have swollen to a ridiculous size. The novel is divided into sections, each of which follows from what came before but has a different enough focus and storyline that some readers may end up finding the book to be uneven. I, however, enjoyed all of the different sections. It did sometimes take me a chapter to two to get fully immersed in a new section, but once I had made the transition, I was hooked. In some ways, this book reminded me of Amitav Ghosh’s Sea of Poppies, a book that I ended up loving despite taking a while to warm up to. I found The Thousand Autumns to be nearly as rich and complex but requiring slightly less focused concentration. Mitchell does not engage in quite as much linguistic play (although he doesn’t eschew it entirely), and Mitchell’s characters are more closely connected to one another early in the story and only spin off into their own tales later in the book. So in that sense, Mitchell’s book is perhaps more accessible than Ghosh’s although I imagine fans of one are likely to enjoy the other. The Thousand Autumns of Jacob de Zoet has already been published in the UK, but it won’t be released in the US until June 29. It’s a book to look forward to, and I look forward to reading more Mitchell in the future. Other reviews: Farm Lane Books, Cornflower Books, Asylum, Just William’s Luck, Stuck in a Book and Another Cookie Crumbles. This is one I must get. I’m marking June 29 on my calendar right away. Hope you enjoy it James! ‘Sea Of Poppies’ is one of my favourite novels and I felt it should really have won the Booker instead of ‘White Tiger’, so if this is similar it’s going to have to go on the library list right away. Given the number of other library books lying around waiting to be read, I rather hope there’s a queue! I didn’t read Sea of Poppies until last year, but I did like it better than The White Tiger. I’ll be curious to see whether this ends up on the Booker list. And I hear you on the hoping for a library queue. There are just too many good books to read, aren’t there? It is interesting that you compare it to Sea of Poppies. I didn’t enjoy Sea of Poppies much – the bit at sea didn’t appeal to me much. So I’m afraid that disproves your theory :-) I did love the beginning of Sea of Poppies though, so I’m sure I’ll enjoy Ghosh’s books that aren’t full of sea slang! Thousand Autumns did require a bit of effort to read and I enjoyed it, but it is my least favourite of his books. Cloud Atlas was fantastic, so it is good to know that you loved it too. Jackie, I wonder if your love of David Mitchell helped you see past the similarities to Sea of Poppies–and it’s true that this doesn’t have as much seafaring as Sea of Poppies, so there’s a difference. I haven’t actually read Cloud Atlas yet, but I’m looking forward to trying more Mitchell, especially if his other books are just as good or better! Jenny, So funny how our reading tastes change. I’m rereading Cold Comfort Farm now, which I read in college, but didn’t quite see the humor in. Now I think I was just humor deprived in those days. I’m eager to hear what you think of Sea of Poppies. And if you like it, this might be the right book to go to for more Mitchell (not having read anything else of his, I couldn’t say, though). I enjoyed this book, although like Jackie, it’s the least favourite of the three books by him that I’ve read. You make a good point about the east v. west side of things, and how neither side comes across as “superior” or “inferior” – it’s not something that immediately struck me when I read the book, but as I read your review, I was nodding along in agreement. Yes, the book was occasionally slow, and at times, difficult to get into. However, it was well worth it at the end of the day, and I did enjoy reading it. Do you already have another Mitchell on the list? I tried reading Cloud Atlas for a book club about 3 years ago and really couldn’t stand it. I found it overwritten and purposefully purple in its prose (yay! alliteration! ), so I gave it up fairly quickly. But so many readers I respect sing Mitchell’s praises so I would like to give him another go. I think I might try Cloud Atlas again, because it may have been that I just wasn’t in the right mindset at the time. The fact that you enjoyed this book so much certainly makes me think that I would be well served by trying Mitchell again. Steph, For what it’s worth, I didn’t find the prose here particularly purple, but it is on the elaborate side. The point where prose crosses from elaborate to overwritten probably depends on the reader, though.